Russian President Dmitry Medvedev ordered the Prosecutor General’s Office to probe the legality of the verdicts handed down to 32 prisoners, including former Yukos head Mikhail Khodorkovsky and his business partner Platon Lebedev, the Kremlin said on Monday. The president also ordered a probe into the verdict in the case of the former Yukos security head, Alexey Pichugin, who received a life sentence in 2007 for organizing murders and assassination attempts against Yukos rivals, the Kremlin press service said. 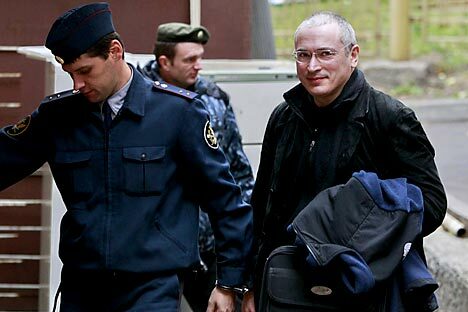 Khodorkovsky has been in jail on charges of fraud and tax evasion since his arrest on a Siberian airport runway in 2003, which his supporters claim was punishment for funding the liberal opposition at a time when Vladimir Putin was beginning to create a “vertical power structure.” Khodorkovsky’s lawyer Yury Schmidt said he does not know what to expect from Medvedev’s order. Platonov’s lawyer Konstantin Rivkin hailed Medvedev’s decision, saying the president’s patience over the Yukos case seemed to be near breaking point. Medvedev’s move comes a month after two opposition figures, journalist Olga Romanova and State Duma member Gennady Gudkov, submitted a list of 39 inmates whom they describe as “political prisoners,” to the presidential administration. Among the names on Romanova’s list are Khodorkovsky and Lebedev, who were jailed on fraud charges, Other Russia activist Taisiya Osipova, who was convicted on drugs charges, and Interior Ministry officer Sergei Arakcheyev, sentenced for killing three civilians during the military conflict in Chechnya in 2003. Originally published at RIA Novosti.